Located East bound rest area US94 1.75 Miles East of 89 interchange Lake Mills WI Coordinates Lat N 43:05':166" Lon W -88:52':464"
This is glaciated country. Here, as you approach the western edge of Wisconsin's kettle moraine, you see many land features created by glacial ice some 15,000 years ago. Among the most interesting of these are long, oval hills known as drumlins. 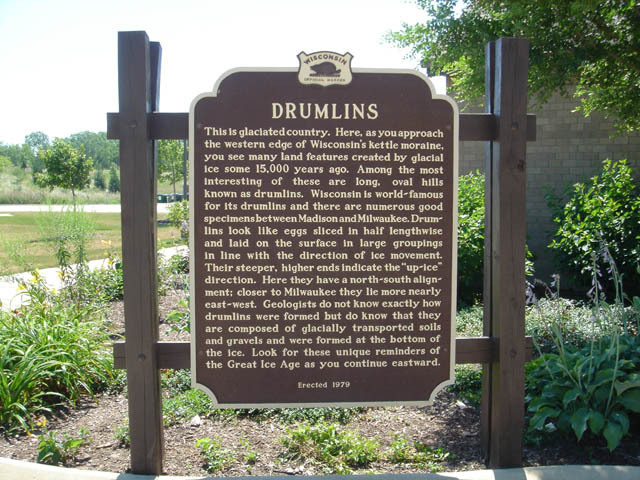 Wisconsin is world-famous for its drumlins and there are numerous good specimens between Madison and Milwaukee. Drumlins look like eggs sliced in half lengthwise and laid on the surface in large groupings in line with the direction of ice movement. Their steeper, higher ends indicate the "up-ice" direction. Here they have a north-south alignment; closer to Milwaukee they lie more nearly east-west. Geologists do not know exactly how drumlins were formed but do know that they are composed of glacially transported soils and gravels and were formed at the bottom of the ice. Look for these unique reminders of the Great Ice Age as you continue eastward.